Can Squirrels code RIAs in Adobe Flex? My life is very weird. This morning I was making coffee when I saw a cute black animal pop up from behind my wife's desk. A squirrel. Despite trying to chase it out, scare it, bribe it outside with food and water, it keeps running back into our house. I felt bad that I had to leave for a few hours so I fed it some nuts and stuff. I think I scared it though when I asked it towards the end of this video if it wanted to help me code up some RIAs in Adobe Flex. Every day I think my life cannot get weirder but it does. 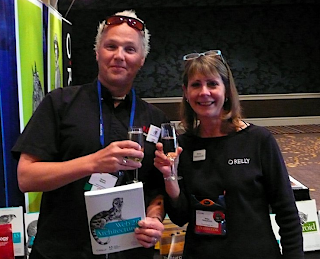 Web 2.0 Architecture - the book is here! 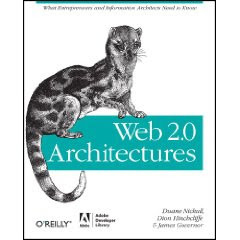 Web 2.0 Architectures, the book, is now out! I got to hold the first physical copy in my hands yesterday! (Thank you Betsy!!). James Governor, Dion Hinchcliffe, and I put in a ton of work, but there are so many other people that contributed to this book or helped us with our research that I couldn't even begin to list them all. The number one thank you I do want to make though is to O'Reilly -- specifically Tim O'Reilly, Steve Weiss and Simon St. Laurent. Simon played such a pivotal role in this book I feel his name should be on it as a co-author. Here are my other thank yous in no particular order. colleagues who have helped me over the years in this high-tech life. This is a simple tutorial you can complete in about 5 minutes once you have the required files. Download the full BlazeDS package from http://www.web2open.org/courses.html (get the Building Service Clients course) and follow along with the video. Written instructions and the source code for this are available from the download. I just finished giving a course on map-based RIA development in Adobe AIR and Flex at Where 2.0. Where often begins with the notion of a location. Service Oriented Architecture allows mashup clients to use location-based services for building rich, interactive media clients. In this course you will build six map-based projects in a largely (85%) hands on learning environment using Adobe Flex and AIR. This lab preparation assumes you need to install everything from scratch. While these instructions cover installing a standalone Flex Builder, it is also possible to install Flex Builder as an Eclipse plugin. Please seek out and follow the instructions from the Adobe website if you wish to install the plugin version. Where possible, notes are augmented for Mac OS X, Linux, and Windows. A. Installing and configuring Adobe Flex Builder. 1. Go to http://www.adobe.com/cfusion/entitlement/index.cfm?e=flexbuilder3 and download the Flex Builder trial. 2. Open up the disk image and follow the on screen instructions. 3. Note where you set up your workspace. This is where you will place all the files you work on and various libraries needed for this course. 4. Mac OS X: By default, this will be under your ~home_directory/Documents/Flex Builder 3. 5. Windows: By default, this will be under your c:\Program Files\Adobe\Flex Builder 3. 6. For the Linux version, download the plugin from http://labs.adobe.com/downloads/flexbuilder_linux.html. 7. Run the installer either marking it as executable (chmod +x) or by using a shell to execute it (sh flexbuilder_linux_install_a4_081408.bin). 8. When prompted, specify whether to install Flash Player 9 (note that this is an updated version of Flash Player 9 and that Flex Builder Linux will work with earlier versions of Flash Player 9 for Linux). This is the debug version of Flash Player 9, which is required for debugging support and exception display. B. Set up and account with Yahoo and download the SWC file. 2. Sign in if you already have an account or register for a new one. If you have already registered for an API key, you can see it via the hyperlink near the top of the page. 9. If you do not have an API key, fill in the form and agree to any license terms. 10. Click “Submit” and a key will be generated for you. Make sure you save it somewhere in a text file on your desktop. C. Accessing the YahooMaps.swc file. 2. Save the zip to your hard drive and open the archive. You will see a file called YahooMaps.swc inside the zip. 3. Remember the location of this file as you will need it for Labs 2,3,4.
d. Download the ESRI ArcGIS SWC library. 2. Agree to the terms and conditions of the license and click “Download”. 3. Save the file to your hard drive as you will need it for labs 5,6,7. 4. Unzip the file and you will see a SWC file as shown in the course setup guide. 5. Remember the location of this file as you will need it for labs 4,5,6. That is all for now – now you can start the labs.